Chevy, which had offered scant truck support in the past, despite having the most trucks (about 17 of some 40 trucks in the series), is suddenly fielding four factory trucks in 2004. Three of those are also sponsored by GM—fully paid for out of the home office's budget. It has created a research and development team dedicated solely to trucks, offered its teams more wind-tunnel testing time, and hired a shock-absorber engineer, among other upgrades. Ford, whose F-series trucks have been the top-selling motor vehicles in the U.S. for 22 consecutive years, has convinced Roush and Robert Yates to pool their engine-building resources for the good of all Fords. The corporation is also working more closely and sharing more information with its teams. As for Dodge's commitment, lead driver Bobby Hamilton cites "my 19 wind-tunnel dates last year" as evidence of the company's determination about truck racing and says it would be "hard to get any more support." I’m aware now that NASCAR seeks to be less exclusive with the implementation of the Drive for Diversity program to help with changing the stigma of catering to an all-white male majority. Curiously, The Drive for Diversity was conceived in 2004 around the time Toyota joined NASCAR and should be just the tip of the iceberg in how change within NASCAR can help to ensure its own survival. "Racers are different than most people. We don't have much fear. Even when things happen like this, we try to look at the positives that come from it and see what we can learn from it and make things safer for other people." The projects are part of a larger effort to boost farming in the Appalachia region of Eastern Kentucky, which was decimated throughout the 20th century as people turned to coal mining and other factory jobs in the area. According to Richard Parnas, a Professor of Chemical Engineering at the University of Connecticut and a founding partner of RPM Sustainable Technologies (http://rpmst.com/Mission.html), an acre of hemp would yield, under ideal conditions, 30 gallons of biodiesel. The Kentucky Speedway was built on 1,000 acres of land which could, theoretically, generate 30,000 gallons of locally-sourced biodiesel! Mr. Parnas noted that it would only require about 18 weeks to set-up a facility to convert hemp to biodiesel. This is not including the amount of biodiesel which could also be created from used FOG (fats, oil, greases) from the on-site food service facilities. Granted, that racing fuel is methanol, and requires different processing to make from hemp, however, the race teams’ large trucks used to transport the race cars, team equipment, and basically the trucking industry in general, use copious amounts of diesel fuel. Thus, it is also the trucking industry which could benefit from NASCAR being fully engaged with investing in hemp to make biodiesel that could be used in most diesel engines today with very minor modifications. The timing of this coincides with President Obama’s deadline to set new fuel economy standards aimed directly at medium and heavy-duty commercial trucks. "General Kern learned of our qualification efforts with the windshield tear-offs, like those used in NASCAR, on UH-60s, and he directed RAM&SA to leverage other technologies from racing. The RAM division formed a partnership with the Roush-Fenway Racing Team to cheaply test and prove out new materials, coatings, processes and nanotechnology," said Kris Walker, RAM & SA Team Lead, Attack & Unmanned Aerial Systems. Research by NASCAR shows one demographic still in love with cars is Hispanics. That’s why the sport launched a Spanish-language version of NASCAR.com and brought a NASCAR Toyota Mexico Series race to Phoenix this year. The color of a person’s skin shouldn’t matter with any of our endeavors. Sadly, though, this is not always the case in the history of America and how people are perceived. Some of America’s greatest entertainers, like Miles Davis at the time of NASCAR’s founding, were treated like royalty traveling abroad in Europe. In his home country, however, he still had to enter venues through the back door. One of his greatest works, “The Birth of the Cool”, was in contrast to the extreme heat of racial tension at that time in America. "To be honest, it just doesn't register and never has," he said. "We're very aware of the ability of Lewis' colour to be used as a headline. "But for us, it's just immaterial. We don't hide from the fact he's from a mixed-race background, but it just doesn't matter. "The Tiger Woods label makes you smile and you could argue it's a compliment, but it's just not relevant to our objectives. Whether NASCAR embracing hemp as a material or local source of biofuel, or tolerating cannabis as a legitimate medicine will lure more females or minorities to its fanbase remains to be seen. But if the Drive for Diversity in NASCAR can reflect more of what America looks like, to include the 50% of Americans who are pro-cannabis people like myself, then it’s safe to say that it would be a welcome change to the sport. And as an American that loves racing, I would love NASCAR for it. The future of NASCAR cannot look back but must look forward to an America free from prejudice and energy dependence. These are problems that can be solved by working together with everyone in the American community to provide positive systemic change. It’s the Monday after one of the most storied Super Bowls in recent history. Which probably has as much to do with the states and cities being represented by the two teams playing: the Denver Broncos from Colorado and the Seattle Seahawks from Washington. As of this writing, the outcome of the Super Bowl is unknown. But one thing that out in the open is the prospect of cannabis being legalized at the federal level. This trending discussion is a result of these two teams playing because of its legal status in the states where these two teams take up residence. This is what prompted my interest and research in vaporizers. Vaporizing can be defined as a ‘medicinal delivery system for the respiratory system, both upper and lower’. In the upper respiratory tract, including the sinuses, the vapors/fumes are intended to effect nerve ending (chemo-receptors), and to a small degree absorb into mucus membranes, entering the bloodstream. In the lower respiratory tract, the lungs, the vapors fill air sacs and rapidly enters the bloodstream in large amounts. (4) Anyone who has had asthma has probably used an inhaler which, in essence, provides a medicinal vapor to help with breathing better. Cannabis and tobacco have much in common in that they are largely enjoyed recreationally by smoking. But where tobacco use is the leading preventable cause of disease, disability, and death in the United States (6) only cannabis, which has no cases of overdose being reported (1), will put users at risk of jail regardless of the negative or positive effects on health. Clearly, tobacco use is not only harmful but also deadly. I couldn’t help but to notice the popularity of e-cigarettes (aka electronic cigarettes or pen vaporizers) which have been helping to transition cigarette smokers to a touted “less dangerous” habit. And with the possibility of cannabis finally reaching full-scale legalization, could industrial design play a role in how cannabis becomes a daily part of life with safe and effective products? 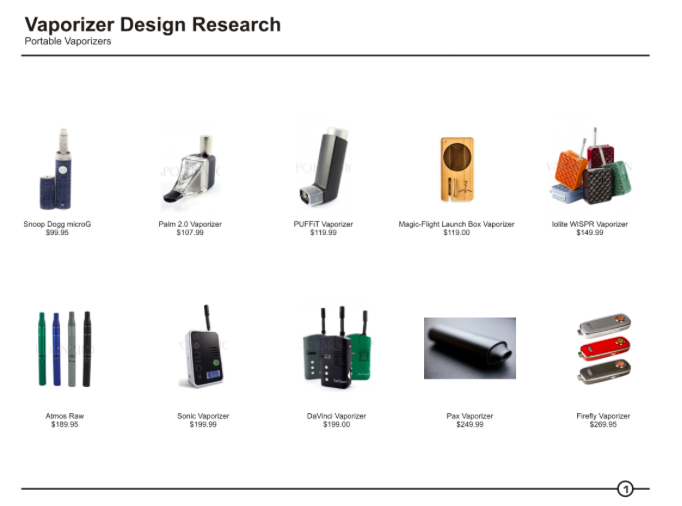 As an industrial designer I put together this design study merely to provide a brief benchmark analysis of vaporizer products available today to examine pricing, styling, some user-interface features, and a look into one retail establishment that sells e-cigarettes. When compared to other consumer products, these vaporizers can range in prices comparable to a pair of running shoes all the way up to a decent personal computer. The products featured here are by no means all-inclusive. If anything, the samples provided could be considered the first generation of commercially available vaporizers and will most likely evolve. Some are exclusively for tobacco where others can be used for whatever the user decides to inhale. Regarding the portable vaporizers featured on slide 1, the I.D. mantra “Form follows function” can be seen where the technology used to create the vapor drives the form factor. The Palm 2.0 is quite basic and others like the Iolite WISPR feature some intricate design details which help to provide greater product differentiation. Curiously noteworthy is the celebrity branding of the Snoop Dogg Micro G pen vaporizer. It isn’t surprising the extensive use of metal and plastic but the use of wood with the Magic Flight Launch Box Vaporizer appears to blend an organic feel with modern technology. The tabletop vaporizers on slide 2 are just as diverse as the previously mentioned portable vaporizers with their use of different materials. But with these, there are more user features available which also seem to affect their pricing. When using a vaporizer, the idea is to have a high enough setting to boil off the terpenoids you want, without boiling off waxes, or burning off plant matter. (4) As they are larger than the portable models, this is an attribute that the tabletop versions can better accommodate as they afford more real estate for more control settings and to provide feedback. 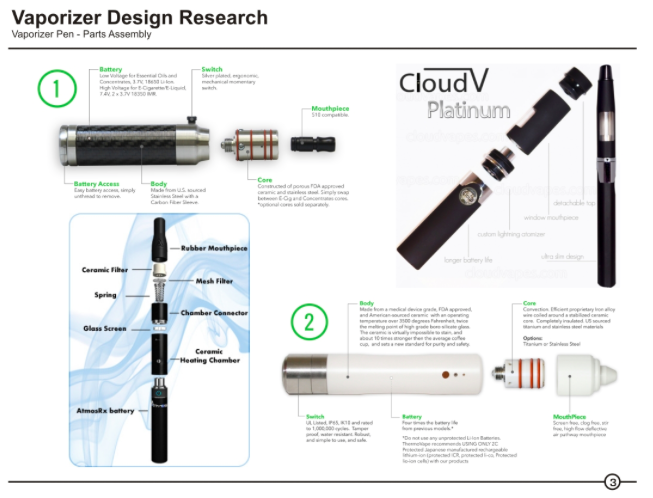 These exploded views on slide 3 were provided by their respective manufacturers and provide some details into the different materials and other specs that go into making the pen vaporizers work. With materials like medical-grade ceramics, stainless steel, titanium, and carbon fiber, these portable vaporizers provide their users a high-end experience. As mentioned, the larger tabletop vaporizers have a better ability at providing the user details about their vaporizing use. How, then, would a smaller handheld vaporizer provide user feedback? Indeed, there is a limited amount of information that can be shared with a handheld device but it was interesting to note the Elevape SV’s use of an app on slide 4 to overcome its diminutive size to share user information. 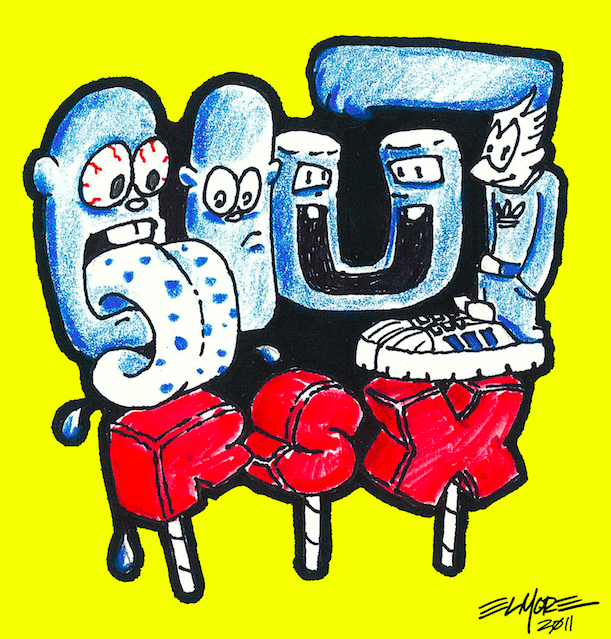 The last part of this design study was to visit a retailer that sold vaporizers. I stopped in at Vapor Smoke, LLC at 148 N. Tyndall Parkway in Panama City to see what they had available. It was a small space with a basic glass counter and little in the way of space embellishment. I spoke with the owner, Rick and co-worker Kathy about their establishment. They specialized in e-cigarettes and have been in operation for about 8 months. Rick mentioned that his former business was one of many affected by the Gulf Oil spill. He started this current venture with money attained as part of the BP settlement to Gulf Coast residents and ever since, “business has been fantastic.” he says. He did have a personal reason to sell e-cigarettes also to help people quit smoking regular cigarettes as he lost his father to lung cancer a few years ago. We spoke briefly about the pending medicinal marijuana initiative in Florida. He and Kathy were enthusiastic about it passing and thought, in general, it would be good for business but also expressed that, like President Obama’s recent sentiment, marijuana was as safe as alcohol. The demand for them comes as an avenue to a “healthier” alternative to smoking cigarettes even with all the unknowns. The same can be said with the use of vaporizers and any emerging recreational/medicinal cannabis market. What role will industrial design play with vaporizers? First, what will drive the demand? Consider the following: health consciousness, image, price points, and ease of use to name a few. Will it matter that cannabis is legal or illegal? Doubtfully because the current market of vaporizers cater first most to tobacco users. That vaporizers can and/or will accommodate other substances will, however, add to their appeal especially if they can be proven to be more beneficial to smoking. A change in the law, then, would allow cannabis users to maximize the potential of vaporizers. Thus, a change in the law, would not only create jobs for the Industrial Design sector but ultimately, usher in a cannabis design era. Why was marijuana made illegal? I initially learned that cannabis' illegality was largely due to 1 person named Harry Anslinger. As I’m the product of a black father and Filipino mother, I couldn’t help but to take offense from discovering Anslinger’s testimony to Congress in 1937 when he stated “…most users were Negroes, Hispanics, Filipinos, and entertainers.” These words made it a personal endeavor to seek a change in the law. Why? Because I believe in the power of good design. Designers know that if the original of something to be mass-produced is of a poor quality, the copies being made will be of equally poor quality. And post-production efforts to rectify a poorly made object can be costly. The laws which govern us are no different and the mold which originally made marijuana illegal almost 3 generations ago, and replicated across 50 states, is evident to have been fundamentally flawed. Skydiving provides one of the greatest highs without drugs. Like most highs, there are risks. By completing a registration form and waiver, you are basically acknowledging those risks prior to committing what may be your first, and maybe last, act of personal choice. Industrial design plays a significant role with this extreme sport be it with the design of the transportation involved to the actual gear used for parachuting. 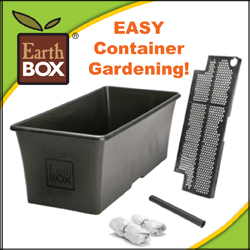 Industrial design can also play a role with a plant, according to the DEA, that has been responsible for zero deaths from overdose. The DEA’s position is that “smoked marijuana is not medicine”. However, it could be argued that the act of smoking cannabis actually reduces the chance of overdosing on it. By contrast, the adult stomach has an average capacity of 1 liter and is the most common method of absorption for over-the-counter drugs. Industrial design plays a role with over-the-counter medicines by addressing the user-interface for the storage of the medicine, materials used for packaging, as well as the design of the packaging. If you maintain an active lifestyle, chances are you are just as likely to suffer effects similar to having consumed cannabis, if you play football or any other recreational sports, regardless of your age. Industrial design plays a significant role in all aspects of every popular sport played in America and can be equally beneficial to making cannabis, a non-lethal plant, safe to consume. This graphic compares the most preferred alcoholic beverage in America versus the most common illicit drug America. As a large-scale industrial process, beer-making is quite energy intensive and uses a great deal of potable water, itself a scarce resource in most parts of the world. As the world population continues to grow, energy and water will become more scrutinized. At the very least, growing cannabis requires significantly less energy and water all the while maintaining the ability to gainfully employ the same types of people necessary to make beer. Additionally, farmers can redirect crops from beer to food sources like wheat, corn, and soy. As a business model, small or large, growing cannabis presents opportunities to incorporate loops that could recover and reuse water while also taking advantage of the post-consumer waste for repackaging. If (according to the DEA, FDA, and ONDCP) marijuana has such a high potential for abuse and has no currently accepted medical use in treatment in the United States then why are we spending the time, money, and resources to synthesize it? With more people going to jail for drugs, the annual cost of incarceration exceeds a year of education at an Ivy League school in some states. As previously mentioned, the DEA unequivocally states that no cases of cannabis overdose have been reported. 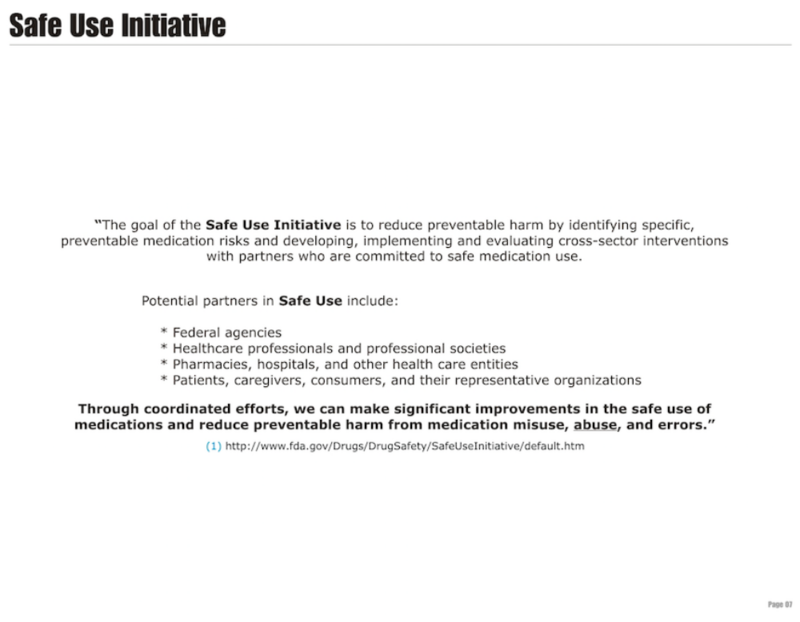 As such, the FDA’s Safe Use Initiative should be a guiding doctrine for the legalization of hemp and marijuana. But, instead, we continue to annually spend the tune of over $14 billion to keep a plant illegal simply because it is NOT a medicine. As Florida already has an existing infrastructure to manage alcohol and tobacco, the challenge could be as simple as adding the words “hemp and marijuana” to the bureaus responsible for managing alcohol and tobacco. With 109 people assigned to manage hemp for industrial purposes (textile, paper, biofuel, and building material) and 109 people to manage marijuana for medical/recreational consumption, legalized marijuana and hemp for the state of Florida could create 218 jobs (or multiplied by 50, America could have 10,900 new jobs). Geographically, Florida takes advantage of the Gulf of Mexico and the Atlantic Ocean for access to international trade routes while also being a part of the contiguous United States with the promise of global legalization. Money raised from legalized cannabis and hemp could go directly towards programs that educate people about alcohol and drug abuse, provide treatment, and prevention. This will also present job opportunities for design policy advocates to collaborate with graphic designers. Using Florida as a test state, the Division of Alcoholic Beverages and Tobacco will play a critical role in transitioning hemp and cannabis to legal status based on a process developed by researchers at the University of Minnesota. This research seeks to be forward thinking beyond the legalization of hemp and cannabis with three objectives: remove the criminal element, create jobs, and to hopefully put America on a path which embraces sustainability. Hemp is illegal primarily because it looks like cannabis. The law is highly critical of cannabis because of the effects it has on our bodies yet we are not free from fossil fuels which, when burned, are significantly more damaging to our bodies and environment with longer lasting effects beyond the span of generations. How much longer is it sustainable where it costs more to incarcerate people (mostly minorities) for a non-lethal plant instead of having them as law abiding taxpayers? These sketches explore conceptual tools to be used by law enforcement. Assuming that there are otherwise law-abiding growers wishing to comply with state and federal regulations, they take a sample of cannabis to test potency and assigns a DNA-related commerce identification number. This will allow growers to have the necessary information to track their product which could also be used for any other marketing purposes. This concept is not unlike a field sobriety test that will measure the patterns of a subject’s brain to determine if a person is actively under the influence of cannabis. This non-intrusive scanner would be used on/around the head. A user-interface would be provided by a handheld smart device. Participants would then be able to track changes in cognitive function which may also help to discourage abuse and, at a minimum, aid the user in determining levels of impairment that may inhibit normal function. As car manufacturers are turning to autonomous vehicles, such a product could also be integrated with a user's vehicular function such that impairment could encourage the autonomous feature. With 5 years of design consulting experience, I have learned to seek positive change where necessary. My process of discovery through design research and applied knowledge using the latest tools in computer aided design have broadened my understanding on how change can increase profits from a desire to know more. My interests in renewable and sustainable technologies further develop a greater appreciation for the planet we live on as we seek better ways of living now for the future. I'd like to thank Jerry for allowing me to share his work. He is a welcome addition to the team of writers for this site. I definitely look forward to what he is working on right now for his 1st post. Please check out his other stellar work Jerry's Porfolio and his Twitter account.